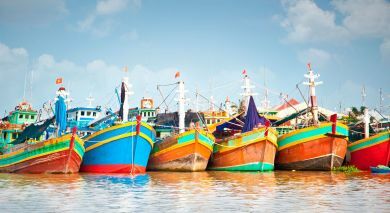 Ho Chi Minh City (HCMC), still often referred to as Saigon, was a Khmer seaport in the 17th century before becoming a French colony. 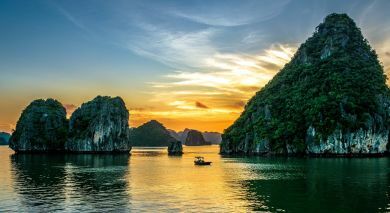 In the 20th century it had a twenty year stint as the capital of South Vietnam, and is the largest city in today’s Vietnam. 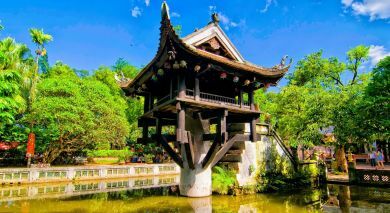 You can witness its amazing blend of European, Vietnamese and Chinese culture through its beautiful architecture, which is dotted by rivers, arroyos and canals. HCMC is rapid and thrilling and, even with the maddening traffic as cyclo drivers speed under vast neon billboards, you can immerse yourselves in variety. HCMC boasts the country’s finest hotels and a plethora of eateries, from simple or Parisian style street cafés to ultra swish Vietnamese and international restaurants. Hotel des Arts Saigon MGallery Collection is an urban retreat at the heart of Ho Chi Minh City in Vietnam. Enjoy stunning views of the Saigon river! Hotel Majestic has occupied pride of place at one of the most convenient and picturesque locations in Ho Chi Minh City since 1925. Conveniently located in the heart of downtown, InterContinental Saigon offers spacious, modern and elegantly appointed rooms including 18 suites and a stylish Presidential Suite. Strategically placed near the airport in Ho Chi Minh City's Dong Khoi neighborhood, Liberty Central Saigon Riverside Hotel is close to famous attractions like Ben Thanh Market, Ho Chi Minh City Hall, Ho Chi Minh City Museum, Reunification Palace, etc. The 9-storey luxury Park Hyatt Saigon Hotel is centrally located at Lam Son Square, near the elegant Opera House in downtown Saigon within walking distance to shopping, entertainment and main tourist attractions. Villa Song Saigon is a boutique hotel set by the banks of the Saigon River in District 2 of Ho Chi Minh City. On this half day excursion you will meet Ms. Nguyen Dzoan Cam Van, one of the most influential Vietnamese chefs, and who has published almost 40 cookery books. Start your day by visiting a local market, where you will see the buying and selling rituals and learn about the tasty ingredients. Following the market, you will drive to Cam Van’s home set near a canal in the tranquil backstreets of Saigon for a hands on cooking class where you can taste the fruits of your labour. 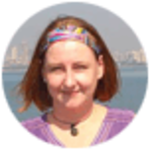 Be entertained by your host and her many stories of travelling the USA to present her native cuisine. In the early evening, why not board the Bonsai, a charming 19th century dragon boat, and enjoy a scenic cruise along the Saigon River? Admire the cityscape floating past whilst you indulge in cocktails and canapes or let the live band tempt you onto the dance floor. Enjoy a buffet consisting of Vietnamese and European cuisine, followed by after dinner drinks (payable) on deck before returning to the pier around 9.30pm. Transfer to your hotel. Visit the War Remnants Museum, showcasing military equipment such as helicopters, fighter jets and curiosities. From a guillotine used for execution in prison to jars showcasing preserved human fetuses, the museum’s collection offers fascinating diversity. Please note, some guests may find some of the exhibits disturbing. Experience Culinary Nirvana on a local food trail through the streets of Saigon’s overcrowdedness astride a vintage Vespa scooter! Sense the sizzle, soak in the aromas, tuck in the treats, indulge in unlimited abundance of street food in this exciting metropolis. Meet your scooter driver and start your epicurean journey. At District 4 taste snail dishes; at District 3 try Banh Xeo (rice pancake with pork and prawns); dine/drink at some authentic street food places; head to a local coffee shop. The Mekong Delta/’rice bowl’ of Vietnam, is a 2hr drive from Saigon via lush rice paddies and fruit farms, en route to Cai Be. 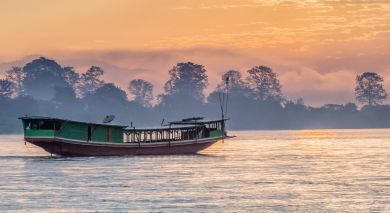 Board the Mekong Queen – a wooden motorboat; cruise the Mekong River; explore Cai Be floating market. Cruise 20min to enjoy a stroll amid palm lined trails/orchards; see traditional Delta life; visit a family-run business. Lunch at an ancient Mandarin house where 4 generations of family members live. Walk/be rowed in a sampan via tiny canals back to the Mekong Queen. Drive two hours northwest of Saigon via urban areas and typical lush Viet countryside to reach the world famous Cu Chi tunnel complex – initially started in 1948 to protect the Viet Cong guerrillas from the French. These tunnels also served as communication routes, food storage facilities, weapon caches, and comprised hospitals and living quarters for guerrilla fighters during the American war. Understand the tunnels’ history, the hardship of life in the tunnels and the Viet resilience during combat. Explore Saigon, a city that never sleeps – volatile yet vibrant, overcrowded yet exciting, Saigon collides a previous era with modernity. Walk by historic landmarks; see lovely French colonial buildings on Dong Khoi street/Rue Catinat; see the Opera House, the former Hotel de Ville and Presidential Palace, Notre Dame Cathedral, Central P.O. Drive 6km away to visit Thien Hau temple in District 5, here make a wish writing it on a small card and attaching to an incense coil in the local custom.